On July 25, the Ministry of Land, Infrastructure, Transport and Tourism (MLIT) released the Japan Property Price indexes for April and for the first quarter of 2018. Japan’s Residential Property Price Index in April was up 2.3% from the previous year, while residential land was down 0.6%. Detached homes were up 0.9%, while apartments were up 4.4%. 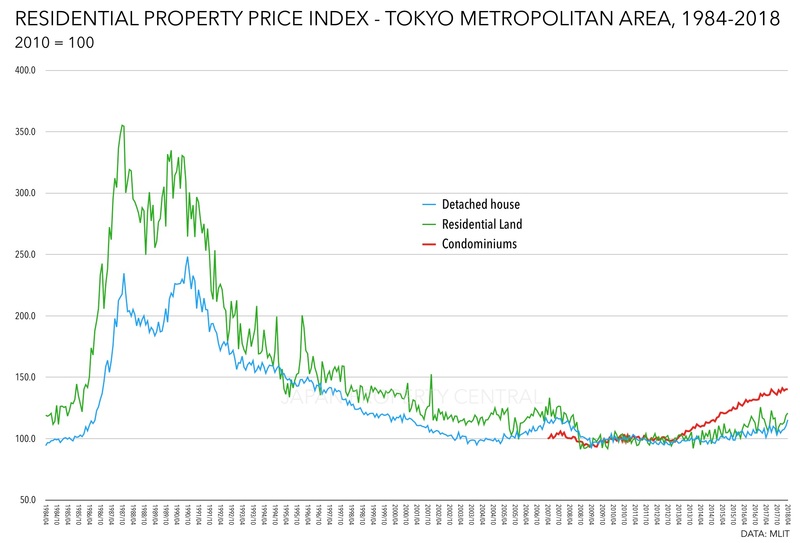 In the Tokyo metropolitan area, residential prices were up 8.5%, while residential land was up 9.1%. Detached houses were up 14.3%, with apartments seeing a 3.5% increase. Nationwide, the Commercial Property Price Index for the first quarter of 2018 was up 4.3% from the first quarter of 2017. Retail prices were up 5.0% and office prices were up 11.1%. 15,820 condominiums were reported to have sold across Japan in April, up 0.1% from the previous year. The average apartment size was 54.7 sqm (589 sq.ft). Condominiums represented 85% of home sales in the Tokyo metropolitan area. The average apartment size was 43 sqm (463 sq.ft), 17% smaller than it was 10 years ago. Source: MLIT, July 25, 2018.